A blend of polymers could make solar power lighter, cheaper and more efficient. (Nanowerk News) A University of Cincinnati research partnership is reporting advances on how to one day make solar cells stronger, lighter, more flexible and less expensive when compared with the current silicon or germanium technology on the market. Yan Jin, a UC doctoral student in the materials science and engineering program, Department of Biomedical, Chemical, and Environmental Engineering, will report results on March 2, at the American Physical Society Meeting in San Antonio, Texas. 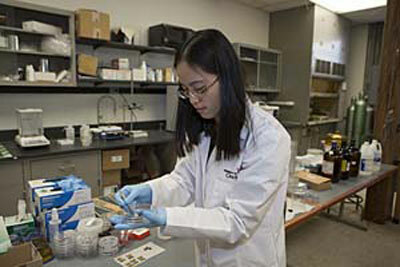 UC doctoral student Yan Jin. Jin will present on how a blend of conjugated polymers resulted in structural and electronic changes that increased efficiency three-fold, by incorporating pristine graphene into the active layer of the carbon-based materials. The technique resulted in better charge transport, short-circuit current and a more than 200-percent improvement in the efficiency of the devices. “We investigated the morphological changes underlying this effect by using small-angle neutron scattering (SANS) studies of the deuterated-P3HT/F8BT with and without graphene,” says Jin. The partnership with the Oak Ridge National Laboratory, U.S. Department of Energy, is exploring how to improve the performance of carbon-based synthetic polymers, with the ultimate goal of making them commercially competitive. Unlike the silicon-or germanium-powered solar cells on the market, polymer substances are less expensive and more malleable. “It would be the sort of cell that you could roll up like a sheet, put it in your backpack and take it with you,” explains Vikram Kuppa, Jin’s advisor and a UC assistant professor of chemical engineering and materials science. One of the main challenges involving polymer-semiconductors is that they have significantly lower charge transport coefficients than traditional, inorganic semiconductors, which are used in the current solar technology. Although polymer cells are thinner and lighter than inorganic devices, these films also capture a smaller portion of the incoming light wavelengths and are much less efficient in converting light energy to electricity. UC doctoral student researcher Yan Jin is photographed with her advisor, Assistant Professor Vikram Kuppa. UC Assistant Professor Vikram Kuppa and Yan Jin. “Our approach is significant because we have now shown peak improvement of over 200 percent on a few different systems, essentially a three-fold increase in the efficiency of the cell by addressing the fundamental problem of poor charge transport,” says Kuppa. Yan’s future research is continuing on the examination of morphology and its connection to solar cell performance. Part of that research will be conducted on state-of-the-art, Ultra Small Angle X-ray Scattering (USAXS) equipment coming to the College of Engineering and Applied Science at UC, the result of a Major Instrumentation Award to Kuppa from the National Science Foundation. Kuppa says the $400,000 piece of equipment is only the second of its kind in a university in the U.S. and the first such instrumentation with multiple-sources and broad-measurement range.